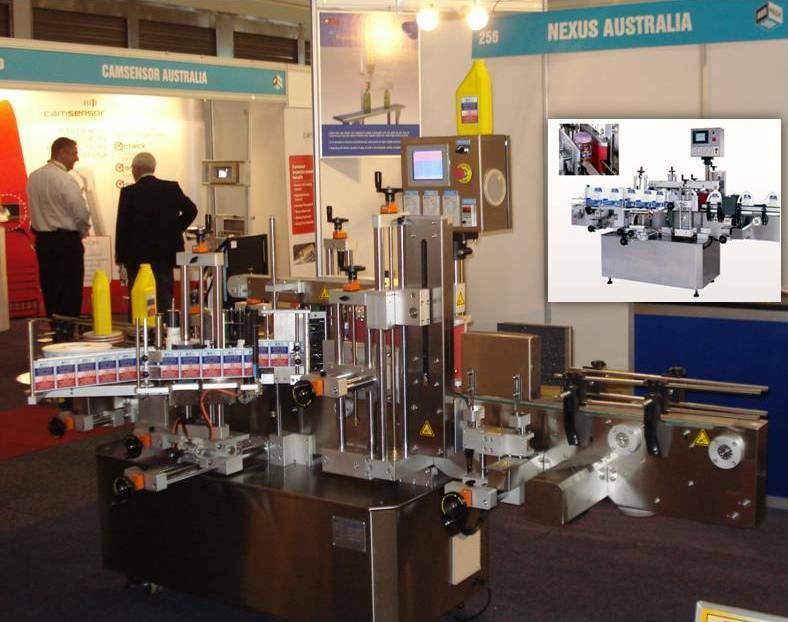 This machine is designed for twin side labeling on flat / oval shape bottles and partial / fully wrap-around labeling on cylindrical bottles. -Misubishi PLC combine with Proface human / machine inter face LCD touch screen control. -Japan made 5-phase stepping motor and driver (Oriental). -Stainless steel frame construction is standard. -Labeling speed is automatically synchronized with conveyor speed to ensure quality labeling. -50 job set-up can be stored in memory for easy recall. -Conveyor driven by variable speed in memory for AC motor (Siemens brand). -Simple adjustments with coupled moement design of two labeling heads with easy access. 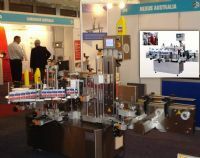 -Positioning wrap station for partial / fully wrap-around labeling on round bottles or containers. 1. Hot Foil Printer for date-coding. 2. "Push and Press" optional attachment is used to ensure smooth labeling without wrinkles or bubbles. 3. Tapered products can take advantage of the "Labeling Heads Angle Adjustment" up to 15 degree for conforming to the product shape. 4. Product separating screw for high speed labeling. 5. LRD-6110 Lion Sensor for transparent labels (USA made).